New Jersey’s state legislature today passed legislation that will subsidize solar at a rate 18 to 28 times greater than a state subsidy for nuclear, a new Environmental Progress analysis finds. New Jersey’s governor told lawmakers he would sign into law the new subsidies for solar, nuclear, as well as a third bill for offshore wind research, as a package. The legislative package subsidizes nuclear at $11 per megawatt-hour (MWh), solar at $210/MWh, and rooftop solar valued at $304/MWh. 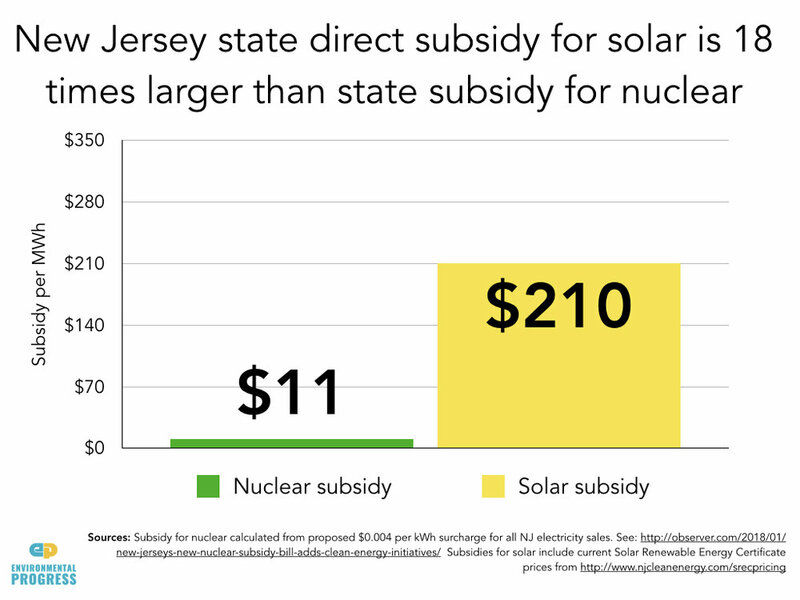 The total annual cost of New Jersey’s primary solar subsidy is $600 million/year compared to $300 million/year for the nuclear subsidy. But the nuclear subsidy will ensure that 40 percent of the state’s electricity comes from nuclear, whereas the new legislation will only raise the share of solar electricity from 3.8 to 5.1 percent. New Jersey’s solar program is already one of the most expensive in the United States, and the new legislation will extend its high costs until 2021. The primary funding source for solar in New Jersey its Solar Renewable Energy Certificates (SREC) program. Program certificates representing one megawatt-hour of solar which have been selling for over $200 each, on average, since 2015. Owners of solar plants or rooftop solar arrays are awarded the credits based on their solar production. Solar owners had been awarded rights to credits for 15 years after constructing their system. The new bill will change this to 10 years. Utilities must then buy and retire these solar credits, or pay a steep penalty to the state. If this penalty remains high while the required percentage of New Jersey electricity from solar continues to increase, the cost of the SREC program will likely continue to subsidize solar electricity at $200 per megawatt-hour. Until today, the penalty, called a Solar Alternative Compliance Payment, had been $308 per megawatt-hour in 2018, before falling steadily to $239 per megawatt-hour in 2028. The new bill changes the 2019 penalty to $268, falling to $178 in 2028. The legislation also raises the amount of electricity New Jersey must obtain from solar by one-fifth — from 4.1% to 5.1%, by 2021, according to the legislation. The new legislation would reduce this requirement after 2021, with uncertain effects on the price of SRECs. Although solar plants would still be eligible to collect certificates, unless the solar requirement was reinstated, or even increased, the average subsidy over the life of the solar facilities may fall from these high values. In addition, New Jersey, in common with many other states, allows homeowners to get credit for their solar electricity at retail prices while the energy being replaced could have been bought by the utility at much lower wholesale prices, a subsidy called net metering. With average wholesale prices in the market around $47/megawatt-hour, New Jersey’s average residential retail prices of $157/MWh suggest that net metering is worth about $94/MWh, after accounting for the efficiency of locally-produced solar avoiding grid losses. Beyond its state programs, New Jersey utility-scale and distributed solar facilities are also eligible for federal tax incentives and benefits front-loaded to the start of each project’s life. The benefit for a 5 kilowatt home system of the 30% Federal Investment Tax Credit, combined with a 25-year life and New Jersey’s residential capacity factor of 13.5%, implies a subsidy of $33 per megawatt-hour over the life of the system, based on estimates from a solar rooftop vendor. Together, New Jersey’s new legislation, SRECs, net metering, and federal tax credits, suggest a current and continuing subsidy above $337 per megawatt-hour for distributed solar PV, which makes up more than half of the current solar production in the state. If electricity consumption in coming years stays at 2017 levels, subsidies for nuclear allowed under this new legislation will be $300 million or less per year. If the subsidy were distributed equally to all nuclear production in the state after the state’s smallest plant, Oyster Creek, closes this year, the subsidy would be $11 per megawatt-hour (MWh) for the 27 terawatt-hours of nuclear generation from two other plants, Hope Creek and Salem. New Jersey’s nuclear subsidy legislation provides for a $0.004 per kilowatt-hour surcharge on all electricity retail sales in the state. In 2017, with 72.9 terawatt-hours of retail sales, this surcharge would collect $291 million. The nuclear bill extends subsidies to plants for three years at a time and would be contingent on plant owners opening their books to state auditors to confirm the existence of revenue shortfall. The subsidy will be charged to all electricity customers in proportion to their electricity usage. If any regional or national subsidy is subsequently offered to these nuclear plants, the new legislation requires the state to claw back the subsidy.